The 14,500 acres of the Ben Damph estate that surround the log house include a remarkable range of mountains, woodlands, fresh water lochs and sea shore; the area has been described as one of the few remaining wildernesses left in Europe. The climbing and hill walking in the area is exceptional with the noted Munros: Liathach, Ben Alligin, Meol Chean Dearg and Beinn Eighe surrounding Loch Torridon. 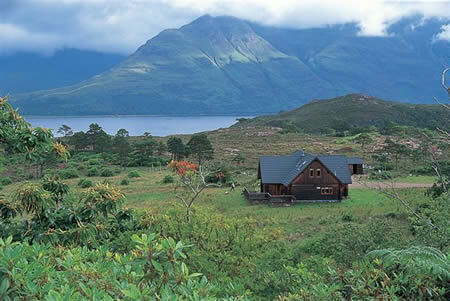 The nearest shop is at Shieldaig, with the Torridon Hotel and Tigh-an-Eilan Hotel both being ten minutes by car. Inverness is 63 miles by road. Loch Damph, which has excellent fishing for wild brown trout and sea trout is 4 miles long, with fish of 10lbs + caught each season in April, May and June. There is an estate boat available on Loch Damph (at extra cost). There is salmon and sea trout fishing available on the River Thrail, as well as red deer stalking and ptarmigan, woodcock and rough shooting. There are over 100 acres of hill lochs with wild brown trout in wonderful locations. There are opportunities for sea fishing, wind surfing and sailing on Loch Torridon and a yacht anchorage in Ob Gorm Mor is available for guests and visiting friends. The immensely impressive Ben Damph lodge is in a spectacular position. It was built in 1992 from 100 year old Scots pine and larch off the estate, by the French-Canadian master craftsman Donald Ouellet using traditional techniques. It is both comfortable and practical and provides accommodation for up to 14 people in 2 double and 2 family rooms.